JPS were excited to sponsor and speak at the ​RIBA Dorset Forum last week. 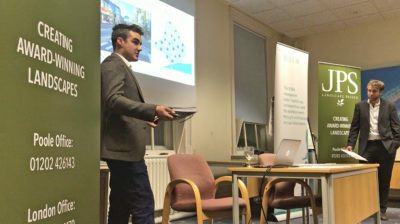 Together, JPS and RIBA invited architects to a packed evening of inspiration and information at Bournemouth Town Hall to examine the way we look at Bournemouth’s future, and how Dorset’s local authority structure is changing. In April 2019, the nine current local authorities will become two unitary authorities. This will have implications and opportunities for architects and landscape architects practising in the county. Chris and Richard presented a thought-provoking analysis of how the landscape is often spatially and historically disconnected from the local communities that use them. They also examined several locations where crime rates are exacerbated by a lack of site-specific landscape design. Together, they offered an alternative vision for Bournemouth, driven by positivity, collaboration and creativity.